Cooking and baking is a big passion of mine and one I’d love to pass on to Caterpillar, and so far he does seem really engaged with making cakes and biscuits. Like many mums and toddlers, it’s something we love to do together. So when I spotted BusyBakers Box on Twitter I had to find out more from them. 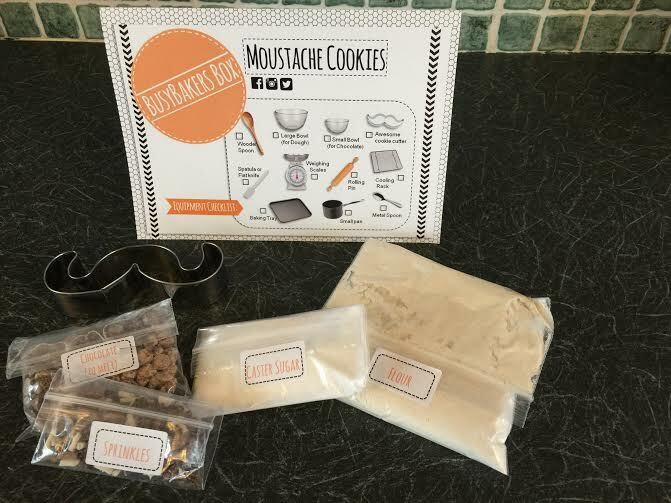 The three mums/teachers behind BusyBakers Box came up with the idea of creating a subscription service which delivers pre-measured baking ingredients and a fun recipe to your door every month, specifically aimed at children under six. Since they are also educators, the kits also work within an educational framework and help to develop children’s key skills. I wasn’t 100% sure what to expect in Caterpillar’s first box but I’ve been so, so impressed. 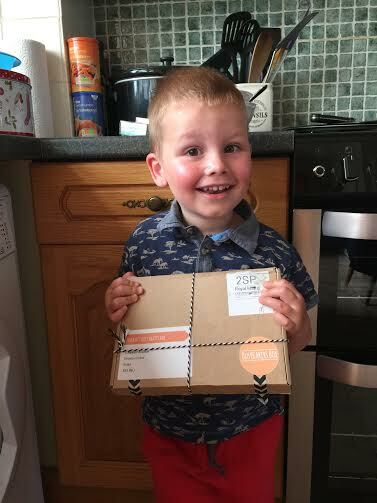 We received our box a few weeks ago and Caterpillar has been desperate to make the moustache biscuits ever since, unfortunately we’ve been mega busy so when I told him today was the day he was crazy excited in a way only a toddler about to make sweet treats can be! The enclosed instructions are so clear and easy to read, with lots of photos too. Caterpillar wanted to be involved in every stage and because BusyBakers Box specifically chose a recipe suited to the younger age group he was able to. 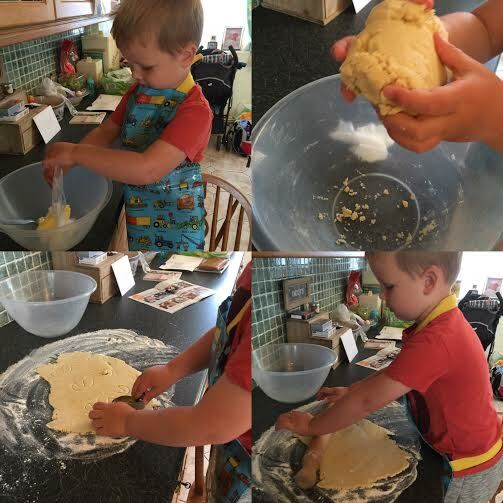 From mixing and kneading to rolling out and cutting, he loved every moment and we had a fab time together. The BusyBaker Box educational rainbow feature – there is a section on the instructions which explains that the product is developed inline with Oftsted’s Early Years Foundation Stage Framework and a key to explain which skills the coloured hexagon on each recipe coincides with. It’s always good to know your little ones are learning something as well as having fun. Attention to detail – e.g. at the top of the instruction sheet it even explains what knead and temperature mean, perfect for our little bakers. 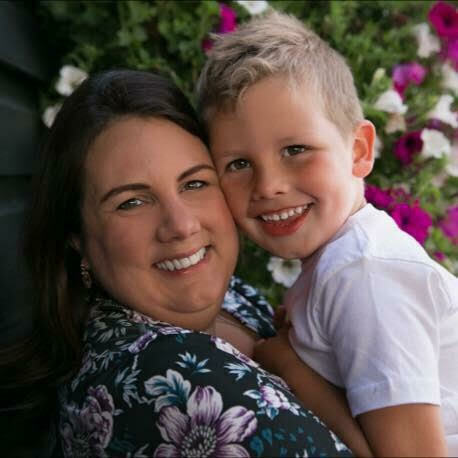 You can really tell how passionate BusyBaker Box’s founders are about baking and education. You get to keep the cool cutter! At only £9 per month/box (or £8.50 if you sign up for three months), it’s also brilliant value for money in my opinion. It would also make a lovely gift for any family you know. As you can tell by now, I’m completely sold on this concept and I’m really curious as to what next month’s box might hold. To find out more, or to subscribe, visit busybakersbox.com. Disclosure: I received one month’s subscription in exchange for an honest review. Opinion and content are all my own. I love this idea! 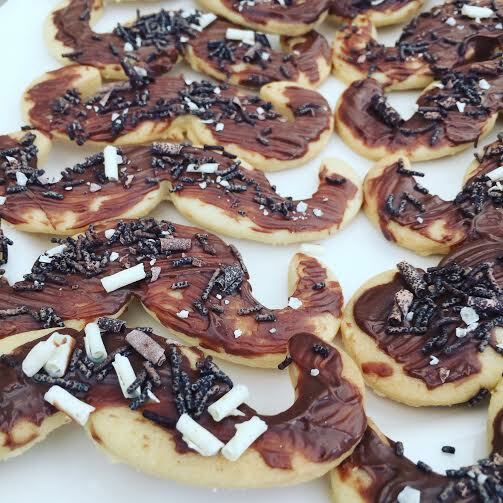 What a fab day to take the hassle out of baking with your little one. My daughter is nearly two but I’ll definitely think about this when she’s a little older. Crummy Mummy recently posted…What’s the perfect gift for a new mum? Sarah recently posted…Art Book Review & Giveaway! Kim Carberry recently posted…Dotty Detective – Book Review.